Construction of Happy Route started in September 1959 and took six years to complete by the workers of 16 minority groups from the surrounding areas. In particular, Ma Pi Leng slope was the toughest and most dangerous part for the brave workers. 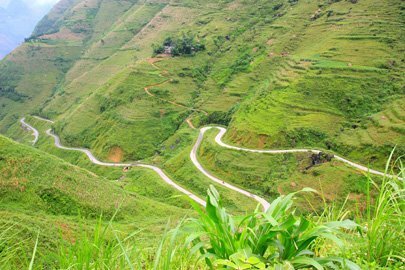 The slope is about 20 kilometers in length and was built in order to go through the peak of Ma Pi Leng which is 2,000meters high in the Dong Van Karst Plateau Global Geopark. Workers risked their lives hanging above the rugged cliffs to chip pieces of rock and tug the explosives to blow the rock and make the path. 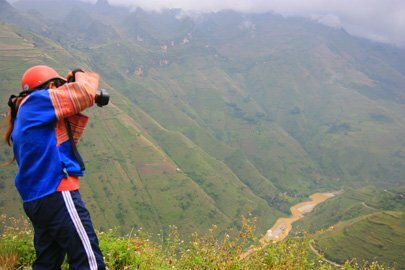 At the peak of Ma Pi Leng is a beautiful house where tourists can take a rest to contemplate the whole area as well as the gorgeous Nho Que River which resembles a small green thread thousands of meters below.